During the summer of 2016 Servus Credit Union had a grand opening for their new Harvest Pointe location in Ellerslie, a neighbourhood in southeast Edmonton. Over the following year they held community events, hoping to meet multiple goals before the summer of 2017. In order to complete their goals, they asked us for targeting help. Their main objectives were to gain 30 more members at this branch; to see Branch Loan Growth reach $13.58M and Branch Deposit Balances reach $24.3M in the first year; to build awareness of the new location; and to build credibility among new and existing members. Specifically, they wanted to split the surrounding area into six zones to figure out which location had the best performing ads so they could get better engagement from devices in these zones. They had planned a number of community activities and online offers to drive traffic to both the branch and website and counted on us to place the ads in the right place at the right time. Servus is the second-largest credit union in Canada and is based in Edmonton. There are more than 380,000 members in 102 locations across Alberta. It amalgamated with other existing credit unions in 2008 and has roots dating back to 1938. 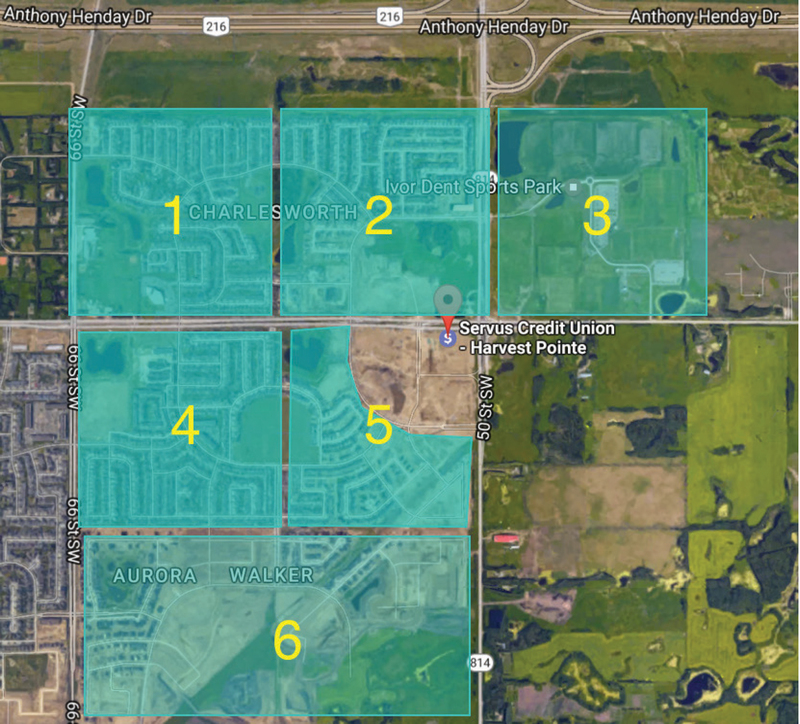 We drew a geofence around each of the six zones bordering Harvest Pointe and delivered ads to devices in these areas between May 15 and July 1, 2017 using our Hyper technology. This approach allows us to target only devices whose owners have a set of qualities the client is looking for. We were able to physically target devices by collecting a potential credit union member’s device ID after one of the ads loaded while they were located within one of the geofenced areas. Those who clicked on an ad were retargeted with additional ads. Midway through the campaign, on June 19, the artwork was switched to ads promoting financial advisory services. The reasons behind creating the six zones were so that Servus could understand if they were communicating effectively to the people in surrounding the neighbourhoods; to target the right households and prevent spillage into the territory of a nearby Servus; and as Servus did not have the staffing resources to hang door signs on every home in the area, we measured the engagement in each area so they knew where to focus their resources. CTR was 6x higher than the year before and that increased to 10x when an artwork change happened midway through the campaign. Deposit balances increased to $24.3 million, branch loans increased to $13.58 million and more than 30 new members joined! All four campaign objectives were achieved and Servus was very pleased and happy to give us full credit as they were running no other media campaigns at the time. Harvest Pointe gained 30 new members during the six-week campaign; Branch Loan Growth reached $13.58M and Branch Deposit Balances reached $24.3M and awareness of the location and credibility among new and existing members was created. Midway through the campaign the artwork was switched. Prior to this switch the campaign had an overall CTR of 0.24% which increased to 0.26% afterwards (and 0.27% the last 13 days of the campaign). Android users showed the strongest CTR for an operating system throughout the entire campaign. Servus was pleased with the results and we continue to work with them on corporate campaigns in many different departments of the company. The interest from this younger demographic was quickly realized with two holds placed within one weekend of the switch. They were keen to reimagine how their week-long event could be made even better and appeal to a broader demographic.